This one picks up not far where Marked left off. Zoey is now in charge of the Daughters of Darkness. Aphrodite is now old news and her 'evil' ways are done. Even Neferet has said that the Goddess has taken away Aphrodite's gift of seeing the future... or has she? Human Teenagers that Zoey used to know are dying and Aphrodite has a vision that ends up saving Zoey's grandmama. So if Aphrodite still has her gift... why would Neferet lie? What's really going on in the House of Night? Who can Zoey trust? Not only is Zoey dealing with all that but her parents aren't helping anything at all... then something really happens that will shake Zoey up for sure. Darkness isn't always evil and light isn't always good. I can be the first one to admit that these aren't the best books out there. While I think there are some great things about this series, I can also say there are some things that could be done better. Much better. My biggest gripe with this series is just how whiny all the characters are. I know that some people have said that this is how teenagers are... and while that is true. Some teenagers can be whiney. Not every single freaking teenager is that way. I wasn't that way. So that being said, I like the writing style. It's fun and fast to read. It's an engaging story. Also, I'm vampire trash so.... anything with vampires, I may just be biased about. Crap, let's just be honest, I've very biased when it comes to vampire novels. I just love it all so much. I like how witchcraft plays a part in this novel. As a Pagan, this is just so cool to me. I love how the ones we think maybe 'evil' characters, aren't always evil. Good isn't always good. There can be this grey area and I feel like this mirrors the real world greatly. I started this series back when only the first three or four were out and I never finished it. So this is a reread so I can finally finish this series and jump into Loved. I think that this series just keeps getting better and better. Not one part in this book have I got bored, P.C and Kristen Cast just keep blowing my mind! I think this is a really interesting book, my favorite part about the whole series is how things just keep on happening and that makes me want to read more. If you liked the first book in the series you will most likely love this one! where are the boys going? when people start disapearing and vampyres are to blame, who's responsible. Zoey is trying to help out, but when one of her boy toys is taken what does she do? The second House of Night book 'Betrayed' was another great adventure. Zoey settled into the house of night and feels like she starting to belong. But human teenagers are being killed, and Zoey try to find a way to stop more from happening. This book was a great thriller and romance. I couldn't stop reading it. This series of books would have to be my favorite. After reading Marked, possibly the most addictive book I have ever read, I was all to anxious to pick up the next installment in theHouse of Night series, Betrayed. And I have to say that my views on the series haven't really changed all that much. The plot was missing for me. It took 300+ pages for 3 basic things to happen. I felt that the storyline could have been executed so much better than it was. I felt very bogged down by all the angst that I didn't feel was needed for the book. The characters continued to be what they were in the the first book. Some characters, mostly the antagonists, developed and changed. But the main characters, the ones I had the most problems with, stayed the same. Zoey's side comments continued to annoy me, even though there was less of them. The writing in these books is definitely not my favorite I have ever read. But it is easy to read, which is always nice. I was thinking I was going to give this book a not-as-good rating, but the last 40 pages or so wouldn't let me stop reading them because of all the action, the characters turning evil, and the mystery. This continues to be a one of the most addicting series I have ever read and I can't wait to read more of the Casts' works, starting with the next book in the series, Chosen. I literally picked up the first four stories at a Walmart because they were there and I needed something different to read. I am SO glad I did. I found myself lost in the world quickly, enjoying how magic and teen life can be seen from a different side of the dark in the world. Though I'm disappointed that the newest books are coming out in hard covers when the first were not, I am still reading them all and eagerly await the next installment. In this one I must say Zoey's hormones were raging. She's with this guy but she still has love for this other guy, while seriously flirting with someone she can't have. This book showed a very bitchy side of Zoey and I LOVED it! Zoey is not to be played with apparently since she's no regular fledgling and I can't wait to see what happens next. if you liked the first book then this book will make you rethink that. it was mindblowing and intense at the same time. it takes from the feel good times in high school to the scary truth about life, love and lust. i have to give props to the authors. it was reallly engaging and always managed to keep you in the dark til the very end. loved this one. can't wait for the next. 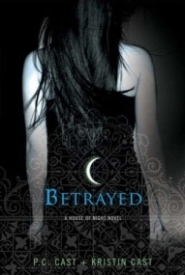 Betrayed is the 2nd book in the House of Night Series. It was really good. I would put the plot down, but it is to long. But, what I did like about the book is that it's not one of those series books that has a different story or plot every book. This just keeps going about Zoey and everything. All the characters are still the same in this one except that Zoey is now the Dark Daughters Leader and Stevie Rae dies. The way she dies is her body rejects the change and she dies slowly but stays alive longer than any other vampire while dying because she has the power of the elements with her. Everything was different with Stevie Rae gone. The mood was a lot worse. You are just suppossed to ignore the feeling but Zoey can't. Stevie Rae was her best friend and she wasn't going to just forget her. But she did try to act as happy as possible. Stevie Rae would want that is what she figured. Aphrodite started acting a little nicer towards Zoey because she knows how losing a best friend and roomate feels because it happened to her once. This was my favorite book in the series and I loved the whole thing.